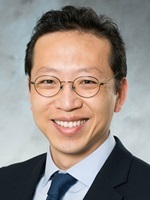 Prior to joining Northwestern's faculty, Dr. Seunghun (Hun) Hong served as a postdoctoral fellow at the Mathematisches Institut of Georg-August-Universität Göttingen in Germany. He earned a bachelor's degree in physics from Seoul National University, master's degrees in mathematics and physics from Tufts University, and a doctorate in mathematics from Penn State. His research interest is in functional analysis in the broader context of mathematical physics.